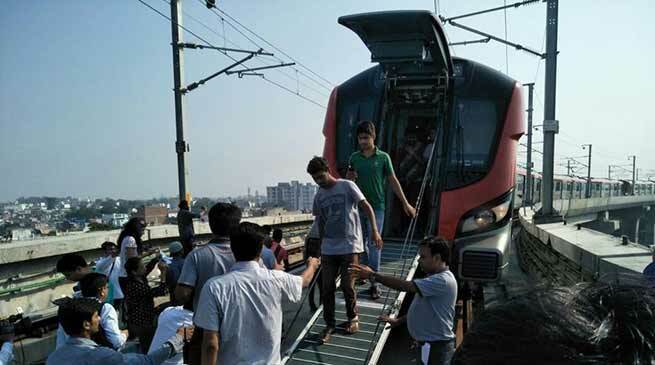 More than 100 passengers of the Lucknow Metro on Wednesday morning being trapped inside the train for more than two hours because of a technical snag that snapped the doors shut. Passengers had to be evacuated from the emergency exit of the train after officials failed to resolve the problem after two hours. The snag occurred around 7.15am on Wednesday when a train going from Charbagh to Transport Nagar suddenly came to a halt before Durgapuri station with a jolt as emergency brakes were applied without the drivers’ knowledge, officials said. The passengers were brought to Transport Nagar on a different train and services suspended for about three hours. Angry passengers complained that they couldn’t reach their destination on time. The snag on the maiden commercial ride of the flagship project came a day after it was inaugurated by Union home minister Rajnath Singh and chief minister Yogi Adityanath.